You’ve done the practice, learned the techniques and the skills. Now, you want to add a bit of flash! There’s no better way to do it then to add light up drumsticks into the mix. These are great to bring out for concerts or even just for fun with home practicing. 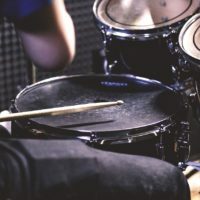 There are a bunch of different types of light up drumsticks available to buy, so we’re going to show you the best ones in this article. Light up drumsticks are also a great cheap gift for drummers. If you’re unsure of what to buy, these will surely impress! We have also included some videos in this article to show you exactly what these light up sticks look like. Note: These are fluorescent sticks, not LED. They light up under stage lights. Our top pick of light up drumsticks are manufactured by Rockstix. These are a really popular option and we highly recommend them. They switch between 13 different color effects which fade between. They activate based on motion, so they actually visually respond to your beat! They are made out of a hard plastic so they are nicely durable. They can be used on all types of drum sets, including both electric and acoustic models. 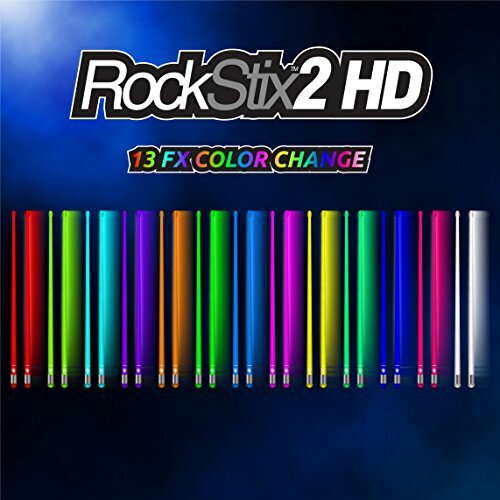 The battery usage is low on these because Rockstix use LED technology. Batteries come with the sticks, but you can also buy replacement ones when needed (size LR44 or AG13). 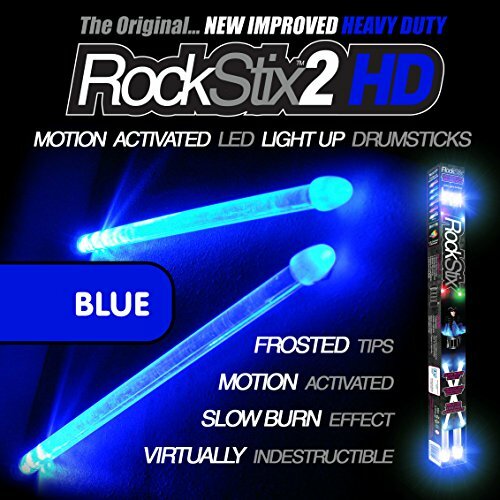 If you don’t want color changing drumsticks, then you can opt for a single color one such as the Rockstixs 2 HD Blue. These usually come a little cheaper. They are very similar in construction to the Rockstix 2 Pro. They also come with batteries of the same type. Note: the video below shows the RED version. These sticks are available to buy in multiple individual colors. Another very popular model of light up drumsticks are the Trophy Firestix. They use the same type of batteries as the previous two models mentioned. They are also made of hard plastic. If you’re buying it as a gift, the box does not look as cool as the Rockstix, but the actual sticks themselves still look great! A different option is these set of wooden fluorescent drumsticks. They are just coated with a fluorescent material, so they do not light up by themselves. However, if you want something to glow but not be too flashy, then these could be a great option. Since they’re made of wood. They will also be more natural to play than the plastic light up sticks. Light up drumsticks are a fantastic and fun option to bring to your performances. They can add a bit of style to your visual playing, which can be great for drummers that are frustrated always being stuck in the background! 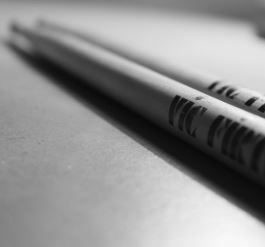 However, regular drumsticks should still be your primary sticks for practicing as these are more natural to play with. Though if you are going to play with light up drumsticks on stage, then be sure to practice with them beforehand also. They are not that different, but an even slight change in feel of a drumstick might take a few minutes to get used to. The light up drumsticks mentioned above are well made but if you are a very hard hitting drummer then you might need to go a little lighter with these. Sick of your boring old pair of drumsticks? Consider buying a pair of light up drumsticks. However, while you’re at it, you might as well make sure that you have your bases covered with a good set of wooden sticks for your everyday playing! If you don’t have a good set of drumsticks already for your primary playing, I’d recommend that you get a good set, such as Vic Firths. They are a bit more expensive than budget sticks, but they are really worth the difference. 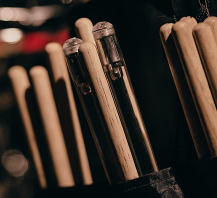 Have a read of our article on how to choose a pair of drumsticks. 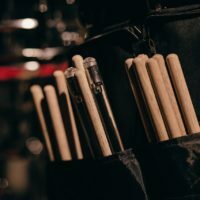 What batteries do I need for LED drumsticks? The first 3 options above all use LR44 or AG13 type batteries. 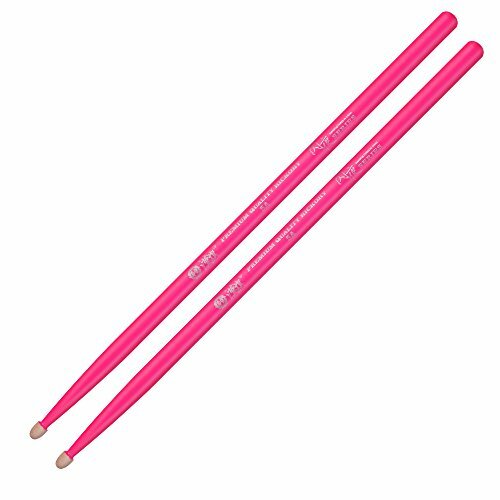 The 4th option (Fluorescent drumsticks) do not require batteries because it’s simply coated with a fluorescent material. Can I practice with light up drumsticks? 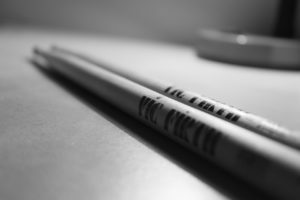 You can practice playing drums with LED drumsticks, but I would recommend that you also have a set of wooden sticks to practice on. Next you should think about what you will be playing with your light up drumsticks. 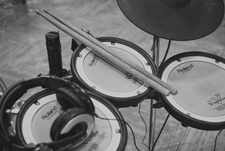 Have a look at our popular articles on electronic drum pads and roll-up drum kits. There are options there to suit all budgets! Light up drumsticks are both cheap and fun. 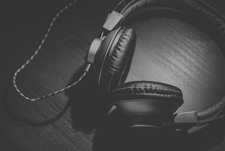 Although I don’t recommend using them as your primary pair, they can be epic additions to your live performance, particularly when you are playing in the dark! If you are searching for a gift for a drummer, then these are a great choice. 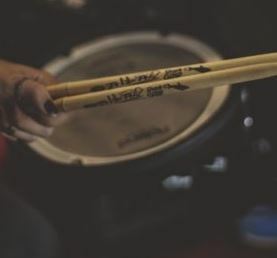 Otherwise be sure to check out our article on the 35+ best gifts for drummers. 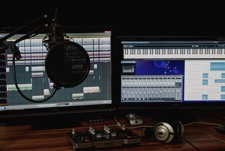 On the lookout for an electronic drum set? Check out our full article which compares the best options to buy! That’s our article on the best light up drumsticks. Happy playing, I hope you enjoy performing with them!